We all know that Rotorua is packed with adventure, Maori and nature experiences, but the North Island city also has a surprising foodie scene. From traditional Moari food to delicious local wines and craft beers, there’s something in Rotorua to suit all tastes and moods. There are more than 80 eateries in the city alone, and you may even be overwhelmed with the offerings on Rotorua’s dedicated “Eat Street”. 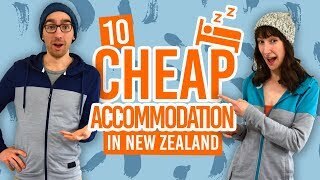 However, if you’re trying to stick to a budget while travelling around New Zealand, then this list of cheap food in Rotorua will help you keep things right! 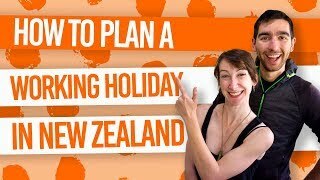 In between tasting local and international flavours, fill up the rest of your time with these 12 Free or Cheap Things to do in Rotorua or stay in one of the 10 Best Backpacker Hostels in Rotorua or 10 Best Budget Accommodation in Rotorua to save more money. Enjoy boutique shopping and taste a variety of etnic cuisine at the Rotorua Night Market, Tutankai Street, Thursdays 5pm-9pm. Try traditional Moari food with a hangi at one of many Maori evening tours in the city. Take a look at 10 Best Maori Tours in New Zealand. Mix award-winning food with excellent views from the Stratosfare Restaurant & Bar at the top of the Skyline gondola, 178 Fairy Springs Road. Try some local wines at the Volcanic Hills Winery, also at the top of the Skyline gondola. Try some local craft beers at BREW Craft Beer Pub, 1103 Tutanekai Street (Eat Street) offering craft beer on tap and bottled. Don’t forget to check out 9 Things to Do in Rotorua at Night. Saturday’s are best spent at Sobar & Cafe, 1104 Tutanekai Street (Eat Street), with their NZ$9 nachos day! Their entire menu offers some of the best-value food in Rotorua, with most meals being around NZ$15. But look out for weekly specials like Tuesday’s “free fries with…” meals and 2-for-1 pizzas, and Wednesday’s NZ$1 wings! There are plenty of delicious treats at Lady Jane’s Ice Cream Parlour, 1092 Tutanekai Street (Eat Street), where you have more than 50 ice cream flavours, Danish waffle cones, sundaes, smoothies and more. Of course, most of the food on the menu is under NZ$10. We would tell you about all the other dishes on the Le Cafe De Paris, 1206 Hinemoa Street, menu but we’re only going to rave about the crepes! Crepes prices range from NZ$8.50-NZ$12.90, plenty of those are under the NZ$10 price point, including ham, egg & cheese; ham, cheese & pineapple; chocolate & cream; sugar & butter; honey or jam; and maple syrup. For cheap and cheerful cafe food that you can grab straight from the cabinet, try The Coffee Club, Redwood Centre, 5 Tarawera Road, before heading into the Redwood Forest. Finally, for some of the best savoury pies in New Zealand, stop by Gold Star Bakery, 89 Old Taupo Road, for some of Patrick’s Pies! Of course, all these naughty pies are under NZ$10 and these Kiwi specialities are a must-try in New Zealand! For a treat-yourself breakfast, don’t miss Lime Caffeteria, Corner of Fenton & Whakaue Streets, with a mouth-watering breakfast menu all under NZ$20. Their breakfast menu, which includes waffles, vanilla risotto and marsala mushrooms, is available 7.30am-3.30pm and they offer good old-fashioned table service. Alternatively, dive into the huge breakfasts at the Abracadabra Cafe & Bar, 1263 Amohia Street, for under NZ$20. They pride themselves on serving free range chicken and eggs, organic coffee and raw juices. Or for something to indulge in for lunch/brunch try, Atticus Finch, 1106 Tutanekai Street, with its metropolitan bistro vibe on Rotorua’s “Eat Street” makes it a great place to hang out and choose from some delicious surf, turf and veggie dishes for under NZ$20. If Italian cuisine is what you crave, then head to Ciccia Italian Cafe, Fenton Street, with some filling treats on their lunch menu all costing $17.90 for restaurant dinner-style dishes, or just skip lunch altogether and indulge in their insane artistic deserts – our favourite is the Freakshake! Crave Indian food? Many of the locals will tell you that Lovely India, 1123 Tutanekai Street, is the best Indian restaurant in Rotorua with a variety of traditional and original dishes. Choose from a wide range of curry meals for under NZ$20, better yet, make more of a saving by choosing from their takeaway menu! Or get something super affordable from the NZ$12.90 lunch menu at Hennessey’s Irish Bar, 1208 Tutanekai Street. Chosen more for its sublime views, rather than its “cheap eats”, The Landing Cafe, 1380 Tarawera Road, is on the edge of the beautiful Lake Tarawera. There are certainly some affordable options, however, on the breakfast and lunch menu with a mix of Kiwi and Asian dishes. Additionally, Third Place Cafe, 35 Lake Road, has amazing views over Lake Rotorua to go with your hearty lunch with a menu of burgers, steak sandwiches, fish & chips, salads and more for under NZ$20. And who doesn’t love high tea?! Try the NZ$17 high tea at the Pavilion Cafe & Restaurant, Distinction Rotorua, Corner of Fenton and Sala Streets, with a selection of treats including finger sandwiches, quiches, brioche, scones, macaroons, cakes and more. For dinner, The Lava Bar & Grill, 1286 Arawa Street, offers awesome backpacker nightlife at backpacker prices. Choose from hearty burgers for NZ$10-$15 or burger, fries and a beverage for NZ$18. Plus, their pizzas are only NZ$12-$13 each! Or sit down in Rotorua’ most popular and oldest pub, Pig & Whistle, Corner of Tutanakai and Haupapa Streets, with a wide menu offering classic “pub meals” (think lamb shank, bangers and mash, burgers, pies and fish & chips). 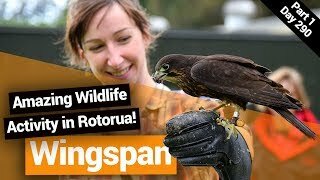 Most meals are under NZ$30, plus, there’s live entertainment every Friday and Saturday, quiz nights on Thursdays, and sports played on the big screens. Urbano Bistro, Corner of Grey and Fenton Street, might not exactly a “cheap eat”, but if you still want that high-end restaurant experience then your best bet is to head there for lunch with plenty of gourmet dishes to gorge on between NZ$20-$30! The restaurant has won countless awards so treat yourself to something special. Another option in the restaurant-style dining category is Terrace Kitchen & Bar, 1029 Tutanekai Street, also offering a luxurious breakfast and lunch menu with everything under NZ$30. 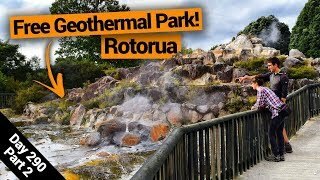 Plus, the geothermally-heated terrace is a nice “Rotorua” touch. When you want more freedom from your dinner menu, try Capers Epicurean, 1181 Euera Street, with a wide range of dinner cabinet foot for some mix and match mains and salads, or choose from their menu with plenty under NZ$30.